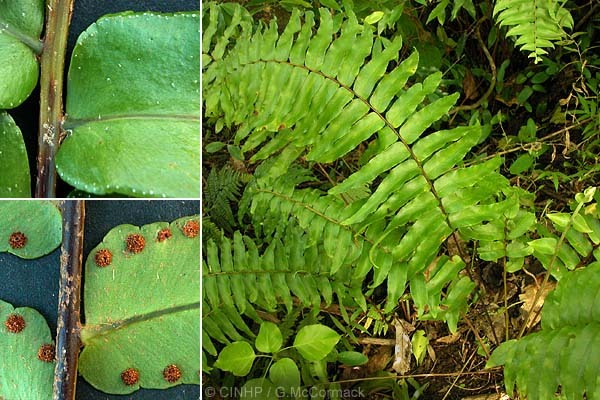 KEY FEATURES: Tufted, erect fern to 200cm. FROND-STALK dark and glossy with brown scales. LEAFLETS ladder-like (=pinnate), glossy above w/wo minute white glands near margin; lance-like, to 180x30mm, base round, tip tapering and sharp; sterile edge minutely toothed; fertile edge with rounded teeth. SORI round, 2mmØ and 2mm from margin, indusium round.